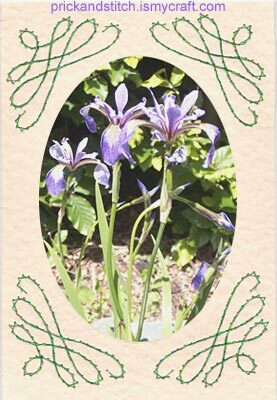 Corner scroll card with an iris picture. The corner scrolls could also be used on a square card by repositioning the pricking pattern. I have just downloaded this pattern and will let you know how I get on with it. I like the idea of framing a design with stitching. Thank you very much for this pattern. I am so hooked on stitching on cards, cannot get enough of them. I first learned stitching about 4 years ago while on a camping weekend. A woman there held a class in making a card with a simple heart on it. I was hooked. I have been making cards to send to friends since then, and for the last year I have been successfully selling them at a local art shop. I have taught many friends to make the cards. Thank you for the free patterns. I read about the bookmarks and actually have the pattern and woul like to use it. I am wondering if a person uses one card to stitch and adds another one to the back–do you just fold a larger piece of paper in half? Another question–how do you preserve the stitching? Have it laminated. Any help appreciated. Thank you David for this sight and all the info. I fold a sheet in half for the bookmarks. It is possible to purchase clear plastic sleeves bookmark size. Some of the larger card craft suppliers, such as Craft Creations, sell them. Laminating is also a good option. I love the idea of stitching the scroll on cards. Will keep looking for more.